Every once in a while, Matt Kaelin opens his kitchen door to let the bugs in. They swarm in, attracted to the light inside of his pantry, and rest on the plants that line the top shelf. But in the morning, they’re gone — snapped up and digested by those plants, the hungry Dionaea muscipula (Venus flytrap), Drosera Capensis, and Nepenthes x dyeriana. Kaelin is horticulturalist, author, photographer and carnivorous plant lover. He collects and grows the plants in his Long Island apartment. 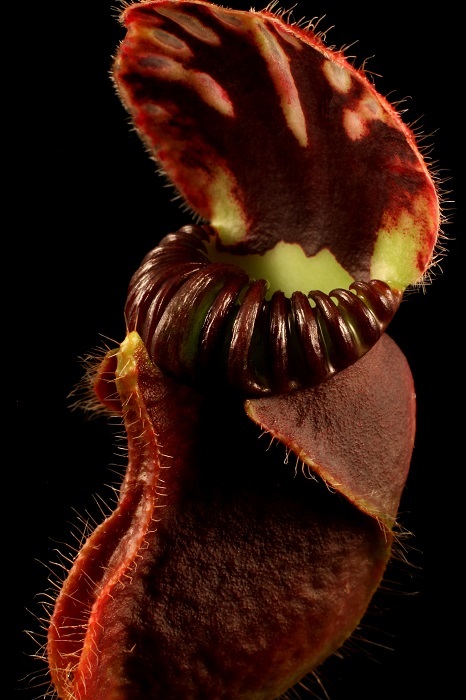 In the basement of Brooklyn’s Morbid Anatomy Museum on Sept. 27, he shared photographs from his new book, “The Sinister Beauty of Carnivorous Plants,” published May 28 by Schiffer Publishing. All of the plants that Kaelin grows and photographs consume bugs, but they didn’t evolve from the same common ancestor. Most developed their appetites independently, due to chance and opportunity in their habitats. What they all have in common, Kaelin explains, is that they live in tough neighborhoods. 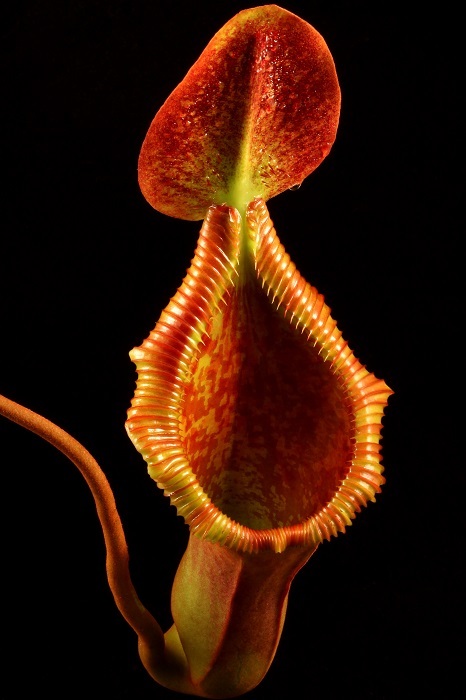 Carnivorous plants grow in nutrient-poor environments, and the insects they consume provide extra nitrogen, phosphorus and other necessary inorganic elements they’re not getting from the soil. “The prey is a mobile pocket of fertilizer,” he says. The plants just have to catch them. Carnivorous plants use all sorts of strategies to trap insects: The long and thin leaves of the Drosera capensis, the Cape sundew, produce a sticky resin to trap bugs, and then curl up around them. Nepenthes x dyeriana, known as pitcher plants, lure their prey into a sticky well full of digestive enzymes. 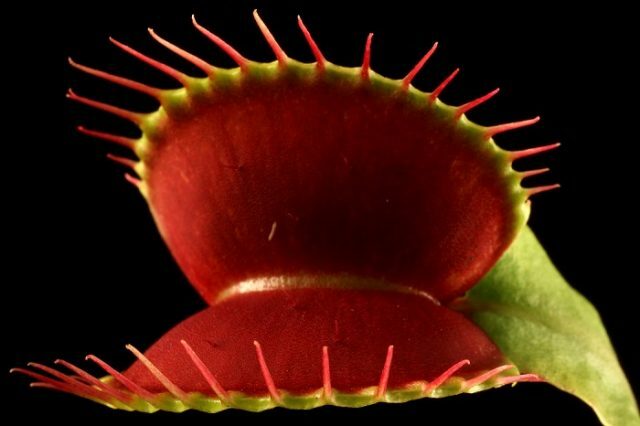 Some plants — such as the famous Venus flytrap — have compartments that snap shut over prey. Though he has no formal training in horticulture (he studied design in college), Kaelin has been interested in carnivorous plants since he was 11. He’s become a largely self-taught expert in the subject, winning horticulture awards, naming carnivorous plant varieties and authoring articles in the International Carnivorous Plant Society’s newsletter. Kaelin sees his plants as individuals, with strength and emotion and personality. He describes his Nepenthese Iowii x ventricosa as a femme fatale, a dangerous woman. Pinguicula moranensis reminds him of John Carpenter’s “The Thing.” Kaelin says he knows when his plants are happy, and what changes to make to the temperature or the soil if they’re sad. He’s so emotionally bonded to his plants that he has a hard time clipping off pieces to photograph. “You’ve cared for something, and then you have to cut off the best and most successful part? It’s kind of a bummer,” he says. He wants to use his photographs to help show others the character and emotion he sees in the plants.